These uncommon subgroups of GISTs are very different to the adult sporadic GISTs with activating KIT or PDGFRA mutations. Their response to the conventional tyrosine kinase inhibitors, imatinib and sunitinib, which are successfully used in the adult sporadic GISTs, is quite variable and not as beneficial in terms of the response rates and duration of response. Paediatric/adolescent GISTS occur in patients under the age of 25 years. They are often located in the stomach, can be multifocal and are mostly wild type i.e. do not have any mutations in KIT or PDGFRA genes. Some of these can be associated with certain syndromes (see below). 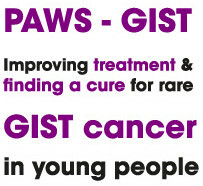 It is usual for PAWS-GIST tumours to be indolent and slow growing so with specialist management the outlook is generally a positive one. About 10% of GIST patients do not have an abnormality / mutation in KIT or PGDRFA genes and although the same drugs are often prescribed as a 'first line' of therapy, they are generally much less effective. These patients are categorized as being 'Wild-type'. 'Wild' in this context means that the genes are as to be found in the 'wild' or in the general population (IE no known abnormalities / mutations). The term Wild-type GIST encompasses a group of diverse sub-types, each profoundly different from the more common form of GIST in their underlying genomic background. So Wild-type GIST is very different from the more common or classic form of GIST in terms of its pathology but it also affects a far broader age range, from very young children to those of an age associated with the more common form of GIST. Wild-type GIST defines a group of sub types, some which share distinct characteristics. Recently it has been identified that about 70% of patients have a defect in the Succinate Dehydrogenase (SDH) complex. SDH is responsible for controlling metabolism and oxygen in the cells of the body. An abnormality in the SDH complex makes the body think cells are low in oxygen so increases oxygen, blood flow and glucose to the cells that may in turn promote tumour growth. SDH-deficient patients also commonly exhibit an over-expression of a protein called IGF1R that may also have a function in terms of tumour development. Sub-group A stained SDH-positive on immunohistochemistry. The primary tumors were either in the gastric and small bowel locations. Mutations in NF1, BRAF cKIT AND PDGRFA were observed in most tumours. Patients generally exhibited spindle cell morphology and were equally split between male and female with a median age of 38. Sub-group B stained SDH-negative and also had an identified SDH gene defect (mutation, deletion, or duplication). Patients more often presented with multi-focal gastric GIST of epithelioid morphology and all tumours expressed global genomic hypermethylation. Patients were predominantly female with a median age at diagnosis of 24. Sub-group C also stained SDH-negative but without an identified SDH gene defect seen. As with group B, patients more often presented with multi-focal gastric GIST of epithelioid morphology and all tumours expressed global genomic hypermethylation. These patients happened to be all female with a median age at diagnosis of 15. Syndromic GIST is the term used to describe GISTS which occur with certain syndromes. Named after Dr. J. Aidan Carney who first described it in 1977. This syndrome is characterized by the presence of several different types of tumors including GIST, pulmonary chondroma, and/or functioning extra-adrenal paraganglioma. If any two of these tumors are present, a diagnosis of the "triad" can be made. CTS is an extremely rare syndrome with just 30 cases reported to include all tumour types. It is characterized by the association of GIST with paragangliomas and pulmonary chondromas. Patients stain SDH-negative but do not present with an as-yet identified SDH mutation. Patients are predominantly female. A rare type of familial GIST and has some similarities to Carney’s Triad.. Researchers from the Carney's Triad and Carney-Stratakis Dyad Consortium have discovered that patients with Carney-Stratakis Syndrome have an inherited mutation in one of three (of the four) genes that code the succinate dehydrogenase protein complex. CSS was first identified in 2002 and is a rare hereditary syndrome characterized by the development of multifocal gastric GIST and paragangliomas. CSS patients stain SDH-negative with identified SDH mutations. Patients split equally between male / female. present with an as-yet identified SDH mutation. Patients are predominantly female. Oher hereditary syndromes associated with an increased risk for GIST are neurofibromatosis type 1 (NF-1), as well as von Recklinghausen�s disease, and Carney� Stratakis syndrome. Neurofibromatosis type 1 is a condition characterized by changes in skin coloring (pigmentation) and the growth of tumors along nerves in the skin, brain, and other parts of the body. The signs and symptoms of this condition vary widely among affected people. Beginning in early childhood, almost all people with NF-1 have multiple caf�-au-lait spots, which are flat patches on the skin that are darker than the surrounding area. Freckles in the underarms and groin typically develop later in childhood.